The sun is shining here in Cleveland Heights but if you step outside, you’ll find out quickly that it’s far from warm out there! The current temperature in Cleveland is only 28 degrees and we’ll see more snow and single digit temperatures next week. Spring is 20 days away and we can’t wait! Today reminds me of heating equipment. Although your heating system may look fine from the outside and although it may seem to be performing correctly, looks can be deceiving! It’s important to have your furnace or boiler inspected annually to make sure it’s running safely and efficiently. From the outside, homeowners are unable to see things such as a crack in their heat exchanger. A cracked heat exchanger can, and eventually will, produce carbon monoxide (CO). CO is an odorless, colorless gas that can be deadly. Homeowners are also unable to see the wires in their heating system from just looking at their equipment. Wires must be connected properly to prevent electric shock. Proper venting of your heating system is also extremely important and should be left to a professional. If your furnace or boiler isn’t venting properly it can cause a back-draft. In other words, your heating system isn’t getting the air it needs which doesn’t allow dangerous exhaust fumes to travel up the flue. I guess the saying “looks can be deceiving” can apply to numerous things from the weather to your heating system! Make sure to have your furnace or boiler inspected annually for safety purposes. Verne & Ellsworth Hann has been serving most of Cuyahoga, Geauga and Lake counties for over 64 years. 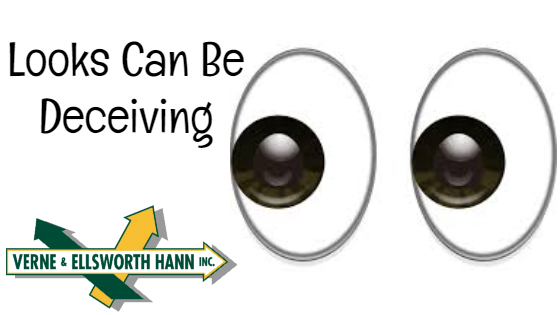 Hann family owned and operated, Verne & Ellsworth Hann is here for all your heating, cooling and plumbing needs.